Porta Mallorquina - Uw makelaar in in Son Gual! U wilt graag een objekt in in Son Gual verkoop kopen of heeft U een vraag over ons aanbod aan onroerend goed of heeft U een vraag m.b.t. Ons aanbod. op Mallorca? Heeft U Uw droom-Villa in in Son Gual noch niet gevonden? Belt U ons op dit nummer aan +34 971 698 242 of stuurt U ons een. Onze Porta Mallorquina makelaar in in Son Gual adviseert graag en vindt voor U dean ook graag Uw droomobjekt. Off site Palmas city, you find the high plateau (138 altitude) of Xorrigo y Son Gual, famous through the rocky gorges and the infrequently plants. The manor Son Gual dates from the Moorish occupation and is situated in the middle of the golf course, which exists since 2 years. Originally, vines, olive trees, carob beans and cereal were grown on the farm. The environment is not yet that much developed, but on the new motorway reachable in a few minutes from Palma. 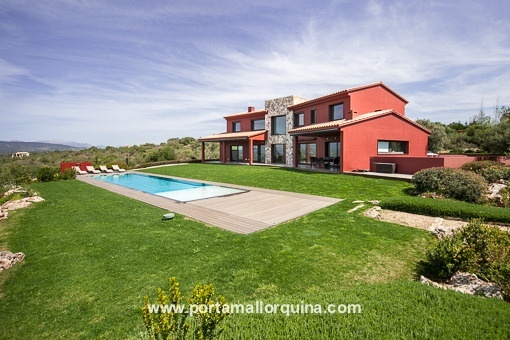 U leest nu: Son Gual: Onroerend goed in Son Gual op Mallorca kopen · Porta Mallorquina Real Estate Beoordeling 4,8/5 uit 95 reviews.